While working outside, gardeners and farmers may discover pest problems they need to answer quickly. 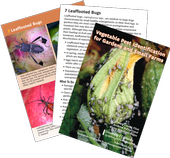 To meet this need, the University of California Division of Agriculture and Natural Resources has recently published the Vegetable Pest Identification for Gardens and Small Farms card set. Goldspotted oak borer. First identified in eastern San Diego County in 2004, the goldspotted oak borer, Agrilus auroguttatus, has killed over 25,000 California native red oaks since its arrival and has now been detected in Riverside County. Larvae feed deep within the phloem, and adults are rarely seen. 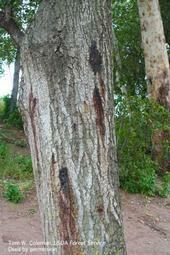 Infestations are recognized by the presence of D-shaped exit holes on trees, often accompanied by bark staining and crown decline. There are currently no good ways to manage the pest in moderate to severely infested trees. Contact your agricultural commissioner if you find infestations outside the known infested area.